Takes 60 minutes , serves . Cut mango cheeks off the seed, then cut lengthwise into ¼” slices. Cut remaining fruit away from seed. In a mixing bowl, coat mango slices and pieces with 1 Tbsp sea salt, then evenly divide to fill 3 1-quart glass jars. Close jars and shake gently to evenly distribute salt. 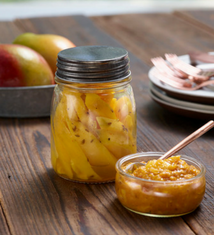 Place jars in a sunny spot or window sill for 4 days to release liquid from the mango. At the end of this time the mangos should be a very light, yellow color, and bubbles will have formed from the fermentation. Shake the jars a few times a day to ensure mangos stay coated in their own juice. After 4 days, drain the mangos and save the liquid. Dry mangos on paper towel for a few hours. Heat canola oil on high in a pot, then add all spices; cook and constantly stir 20-30 seconds, until the whole spices begin to pop and become well toasted. Reduce heat by half and add the reserved liquid, vinegar and honey; cook for 30 seconds. Then add mango and finely minced garlic; cover the pot and cook 2 minutes. Remove from heat and cool completely. Transfer to a blender and pulse to form a slightly smooth/chucky sauce with small particulate pieces. Pour mixture into a clean container with an airtight lid. Amba will keep refrigerated 6-8 weeks.